So Autumn is well on it’s way in and I couldn’t be more excited. Autumn is for cosy nights, fluffy pyjamas, blankets, slipper socks, hot chocolates, brilliant TV and of course, Candles! As I may have mentioned previously I am a candle and home fragrance fanatic (I think I get it from my Momma), I don’t feel like I’m properly ‘home’ till I have a candle on And Autumn/Winter is my favourite scenty season. So here’s a list of my current favourites to inspire you to fragrance your autumn and get cosy! Lolly Rocket- Maple and Coffee Bean. Have you ever seen a more perfect looking Autumn candle?! I first found this small business when another blogger shared some photos of their candles and I knew I had to have one! 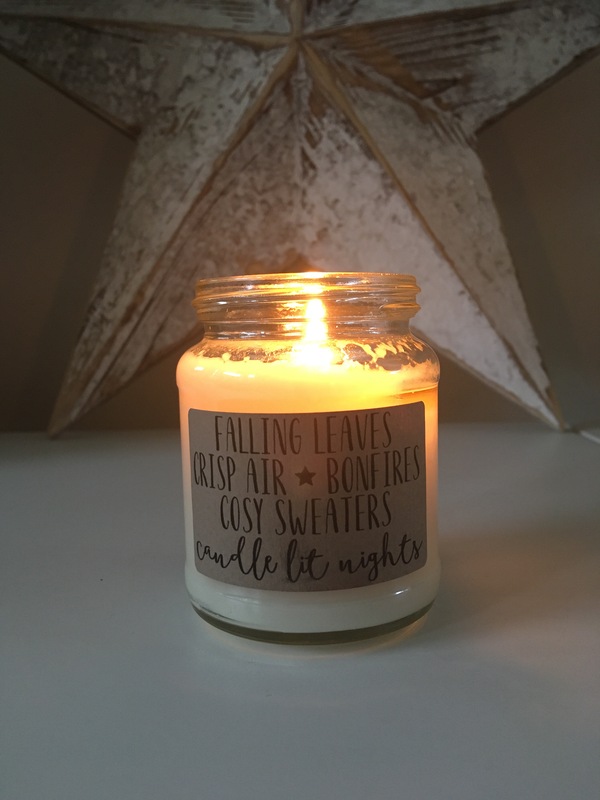 They do candles with lots of different quotes but this Autumn quote one really caught my eye! There’s a choice of Maple and Coffee Bean or Pumpkin pie. I’d usually lean towards the pumpkin pie but I thought I’d be brave and try a new scent. And I absolutely love it! It smells like the Starbucks in Magic Kingdom and is so strong when burning. It’s the perfect kitchen candle and I had it burning this morning while we were having brunch. I’ll definitely be ordering more from Lolly Rocket! So Soy- Caramel, Patchouli and Honey. I talk a little bit more about the benefits of burning soy wax in my later section on wax melts but I do love burning soy wax. This one smells divine. I ordered it out of interest mostly as the scent sounded interesting. It isn’t how I expected it to smell but so much better! Like a really delicious mens aftershave but subtle and calming. This is one for people who don’t like too overpowering scents. It also comes in the prettiest packaging! (Available in 3 different sizes from the So Soy website). Yankee Candle- All is Bright. I feel like a bit of a sell out talking about Yankee, its so cliche. But this one I couldn’t resist, I cant explain the scent, its kind of citrussy but I would say it’s the perfect Autumn/Winter scent for none spice lovers (I am most definitely a spice lover but can understand how it’s not for some people). Yankee candles so always burn so nicely and give off a lovely scent so keep your eyes peeled for this one! I love, love, love this one. It smells exactly how you’d imagine but not as sickly! It’s so comforting with a really good scent throw and looks so pretty burning. Mintoshi is a small business based in Wolverhampton and their candles can be ordered through their Etsy shop, their customer service is fab and once this one is burnt out I’ll definitely be ordering more! I picked this up a few weeks ago as it was a bargain and I couldn’t resist the really pretty autumnal jar. The smell is nice enough for the price but really I’m just all about the jar. ALDI- Luxury Candle Jo Malone Dupes. I’ve seen so many mixed reviews about these on Insta. Some adore them, some saw they smell like cat’s piss…. I am a fan. They smell like Jo Malone and cost less than 4 quid. It would literally be rude to complain. For the price they are really good, they burn so evenly and cleanly and release such a lovely smell. They are availalbe in Pomegranate Noir, Blackberry and Bay and Lime Basil and Mandarin. If you’re a candle fan/ Jo Malone fan and see them in your local Aldi it’s definitely worth picking one (or 3!) up! Bloom Candles- Clementine and Prosecco. Bloom Candles are available online via their website and their candles come in the cutest little jars! Their scents are fresh and lovely give off a lovely scent when burning. They also do their own range of melts and diffusers and for a really sensible price. Maxie treated me to these for our anniversary, I think they arrived a bit smaller than he had imagined but they are quite an expensive brand! I love anything Scandi so they were a perfect gift! I love their packaging and their really fresh, clean scents. This has been my first ever woodwick candle after years of sniffing every one in shops. They’re the brand that are famous for the crackling wick, it took a while for me to get used to the crackling to be honest, can’t thinking I’d left a tap dripping in the kitchen but once I’d got over that the crackling did it make it feel very cosy and comforting! This is a perfect autumnal smell as it’s a bit spicier and deeper than you’d expect from the description. It does give off a lovely scent throw when it’s been melting a while. I’ll be trying more woodwick candles I think! Olivia Blake- Wild Pumpkin and Nutmeg. I first smelt this when on a day drinking trip to York and popped into TK Maxx. They only had it available in 1kg and after much deliberation I decided I couldn’t carry a 1kg candle in my clutch bag around the bars of York. So, I was very excited to find this is a normal size in the Homesense in Leeds. It is an absolutely perfect Autumn fragrance and I love to just sniff it when it’s not lit. When burning it isn’t very strong which I wouldn’t usually mind but I love the scent so much I wanted it to stronger! It is however very much worth the £5.99 I paid! TK Maxx and Homesense are so underrated on the candle front, I’ve had some really lovely candles from there! Another mini Yankee shoutout for the perfect kitchen smell masking scent! Not much else to say about this one really. It does the job! Primark – White Tea and Violet. This is one of those candles they have on the shelves by the checkouts in Primark you usually just walk past but you know, are actually pretty good…for a pound. This scent is perfect for a bathroom! I wouldn’t say they’re the best things in the world but I will say you may be pleasantly suprised! Quick tip for candles: Always burn right to the edge every time they are lit to prevent tunnelling and wasting a lot of the wax. The scent also won’t throw as far in a colder than average room this is particularly true with wax melts, they wont reach their full scent potential until they’re at 80c which is difficult for a little tealight to do on its own if the room is really cold! Now- on that note- let me confess something- I am a wax addict. I mean, it’s not out of control. But it could certainly be creeping onto the addiction scale. I first got into wax melts when I started up my own Etsy shop last year and started connecting with other small business owners, I love the idea of buying something that is the outcome of someones hobby and getting something lovely in return. The vendors I use repeatedly (I’ll list in a minute!) use Soy wax which is vegan, environmentally friendly and burns cleanly, it also holds a lot of scent (amazing value for money) and is very easy to clean if you have an accidental spillage (clumsy problems). So a bit of an obvious one but to melt wax you need a wax burner, they are now available all over, home bargains, tesco, wilkos, amazon and some very pretty ones are available on Etsy! I have a beautiful one from Natyshas Vintage Home. And you obviously need tealights, I go through so many! I tend to stock up on hundreds whenever I’m in Ikea. Some vendors sell their wax in individual melts and to be able to get a good whiff you need to burn 2 at a time, however recently most vendors have switched to wax pots. I like this as they are very easy to store and the plastic tubs preserve the scent for a long time. With these insert a fork into the wax to snap it into two and then once more to get quarters. Insert a quarter at a time into your burner. Each quarter or two melts tend to give 8 hours of scent before it starts to burn off. Tubs average around £2.20ish each for 32 hours worth of fragrance so a bit of a bargain really! It’s also fun to mix the scents! The wax can be stored for up to a year after it’s been made before it starts to lose its fragrance and it’s sometimes good to leave the wax few a few weeks after purchase to let it cure, this stops the fragrance burning off quickly. Cleaves Candles- Their is so much hype around this vendor and it’s so deserved, her scents are amazing and give off the right amount of scent. She does a restock once a month but can literally sell out in minutes! You have to be so fast! She also has a social facebook group called Cleaves chat and mingle which you can join to sell, swap and buy wax! 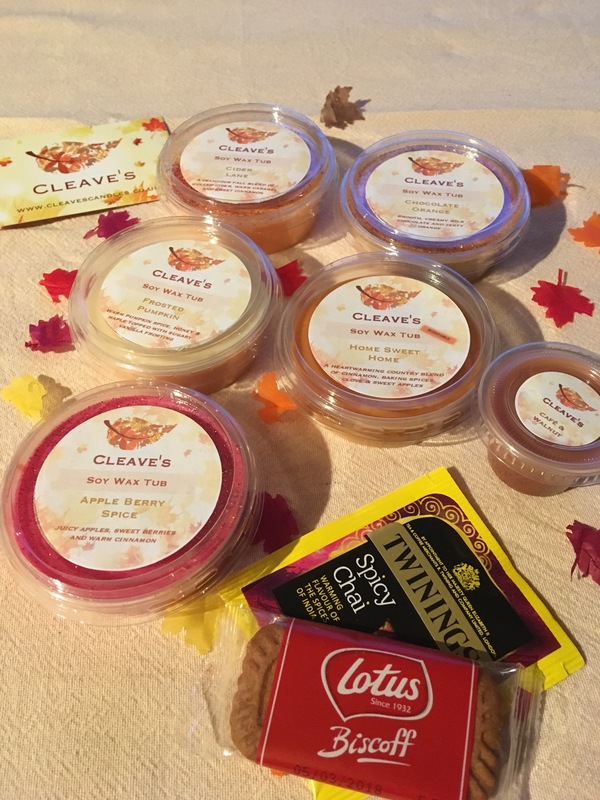 I received my parcel of Autumn wax from Cleaves this week and it’s perfect! My favourite Cleaves scent used to be Magnolia and Orange Blossom but it might have just been beat by Frosted Pumpkin! Wax Melts by Francesca- Her scents are as equally delicious. She uses Beeswax which is also really good for the environment (save the bees) and holds scent so well! I’m signed up for her monthly subscription box which a great way to try new fragrances I wouldn’t really choose myself and is great value for money! She does lovely dupes and special collections along different themes. Make Life Vintage- I love her Lavender blends and Jo Malone/ White Company dupes. They also look prettier than I ever knew wax could look! Aromatic Soy- They do really great value scents and their Etsy shop is always well stocked so no stressful Restock nights trying to check out with stuff before it sells out! They do a Coconut and Mimosa wax which I really love and one the best Lush Snow Fairy dupes I’ve smelt! Scented Wax Boutique- I first tried this vendor when I won one of her giveaways, her wax is lovely and so pretty! I particularly love her Spa Relaxation and Almond Macaroon! Pretty Little Melts- She released her Christmas collection in August and I jumped straight on the band wagon and ordered some. They smell lovely and she does each fragrance in heart melts and tubs which I like as although I do like the tubs I love having packs of melts to fill my tin! Rosie’s Wax Melts- She was the first soy wax vendor I ever tried so I feel quite faithful to her! She does regular restocks and her Autumn collection is lovely! All the pumpkin and spice! Vendors on my ‘To Try’ list: Halliescents, Georgia Lee Candles and Rose and Thistle Wax Patisserie and Oh So Smelly (She literally lives down the road from me so would be rude not to order soon!). Reed Diffusers- I do love a diffuser, I have quite a few scattered around the flat. Next are great for diffusers and my go-to place for ones for the bathrooms. They are great value for how long they last and really do make everything smell a lot nicer! I became a bit complacent to them but went away for the weekend and came back and could really smell them again and they’ve been going since we moved in 4 months ago! In my lounge I have a White Company Pomegranate diffuser. Max bought be this after a few months of really unsubtle hints. It does look so pretty but the smell it gives off is beautiful and comforting and can still smell it as much as the day I opened it (but not in an overpowering way). I also love that they so diffuser refills as it also seems such a waste to just recycle the glass! I’m not one to obsess over labels don’t think the more expensive is always the better but in the way of reed diffusers I do think it’s worth splashing out a bit for a lovely long lasting scent that you don’t get sick of. Saying that, I picked up 2 Aldi Jo Malone dupe diffusers the other day so will report back on them! I’m also really loving my Molton Brown Coco and Sandalwood room spray. This is quite expensive but the scent lasts for ages and smells amazing even when used sparingly! I love giving my lounge a good spritz of this although my lounge probably isn’t worthy of the lovely scent! So there we go! That’s mainly what my flat will be smelling like this Autumn! Stay tuned for a Christmas candle post in the next few months! Posted on September 20, 2017 October 1, 2017 by katiejade92	This entry was posted in Sharing the good stuff., Uncategorized and tagged Autumn, Candle, Candles, Cosy, Fragrance, Home Fragrance, Hygge, Reed Diffuser, Room Spray, Small Business, Wax Melts, What I like. Bookmark the permalink.